A good portion of our house is painted beige. 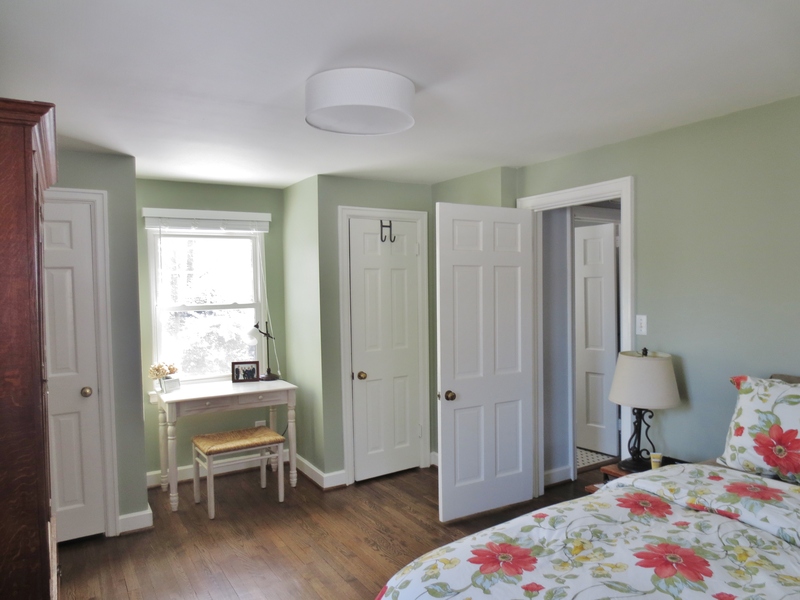 The color is Benjamin Moore’s Berber White in half tint and I am sure that the sellers thought that it was a “good neutral” that would “appeal to many buyers,” but I just don’t think it does anything to help the house feel inviting. Here’s what the room looked like about a year and half ago, before I started making improvements. 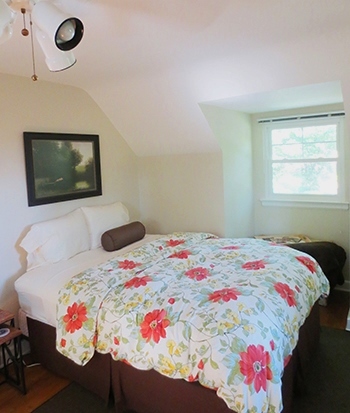 The duvet is from Pottery Barn, was a wedding gift, and is totally the jumping off point for the rest of this room. 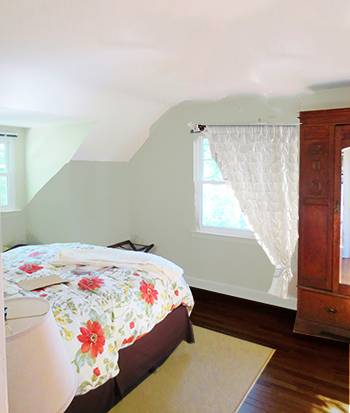 Since this room houses about couple of antique pieces, the feel in here is very traditional. So beige. So boring. So the first thing I did was remove that ceiling fan and replace it with an affordable flush mount. I know ceiling fans are controversial, so here’s my reasoning for removing this one. Our ceilings upstairs aren’t quite 8′ (yay old houses) and with the lights hanging down, it was dangerously low, especially for one of my favorite guests, my 6’5″ dad. So we bought a standing fan that lives in the closest when it’s not needed and since this room is above the garage and has three windows, it stays pretty cool and gets good air flow. Judge me if you must. After we had the floors redone, I got rid of the cheap, old rug and replaced the brown dust ruffle with a cream one. The cream dust ruffle had actually been on our king bed but I was able to “hack” it to fit a queen. The bedroom stayed with just these small updates for maybe another year while we finished the sun room. I was super anxious to get back to it though because I knew a couple hundred dollars and we would be in business. You may remember that I wanted to go with a soft green in here. Here is my inspiration photo that I mocked up in 2013. Note that this was actually before we had the floors redone, but I think I got pretty close to what we ended up with in the mock up below! Ultimately, I settled on Behr’s “Simply Sage” in a half tint. The full color was just the right ratio of green to grey to brown, but it was too dark. So once again, it was half tint for the win! To paint the room, Mark and I moved the smaller furniture pieces out of the room and pushed the larger pieces to the center. 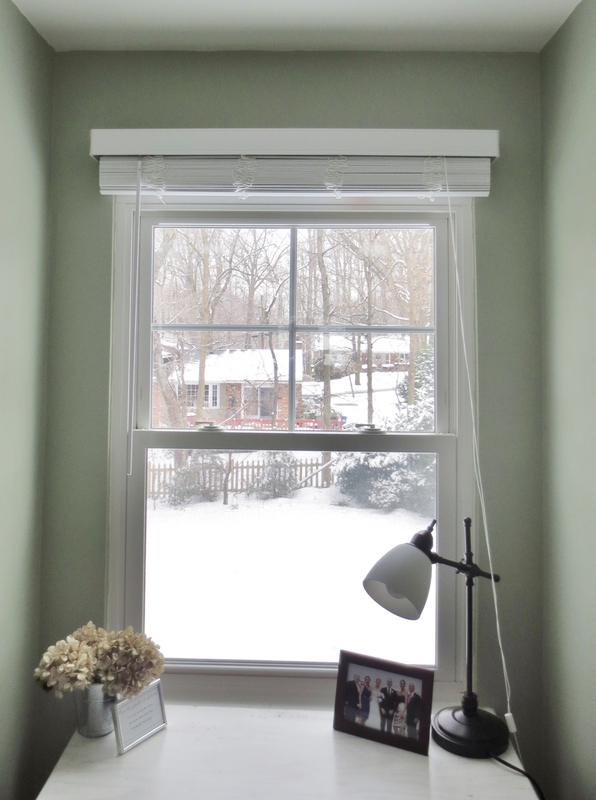 Then we removed all of the old vinyl blinds and their hardware from the window since we would be replacing those as well with faux wood blinds from The Home Depah. We also removed all the outlet panels. We used Behr Marquis interior paint since it’s the best paint that Home Depot sells. It’s a paint and primer in one so we just went right over top of the existing color. We did two light coats. While the paint was drying we headed to Home Depot to purchase the blinds. We measured the windows before we left and were able to find the sizes we needed without having to have them custom cut, which was nice. You should know, however, that they can do that for you in the store. Total cost for three windows = $95.00. Ideally I had hoped to mount these blinds on the interior of the window well as we had done downstairs, but for whatever reason the window wells upstairs are not nearly as deep and mounting anything, even a roller shade, on the inside of the well was just not an option. This bummed me out because I don’t think they look as nice mounted on the outside and I haven’t been able to figure out any way to cover the cheap plastic valance thing. But they do look better that the tired vinyl blinds that were in there previously so we’ll move on for now. Please note all.the.snow. 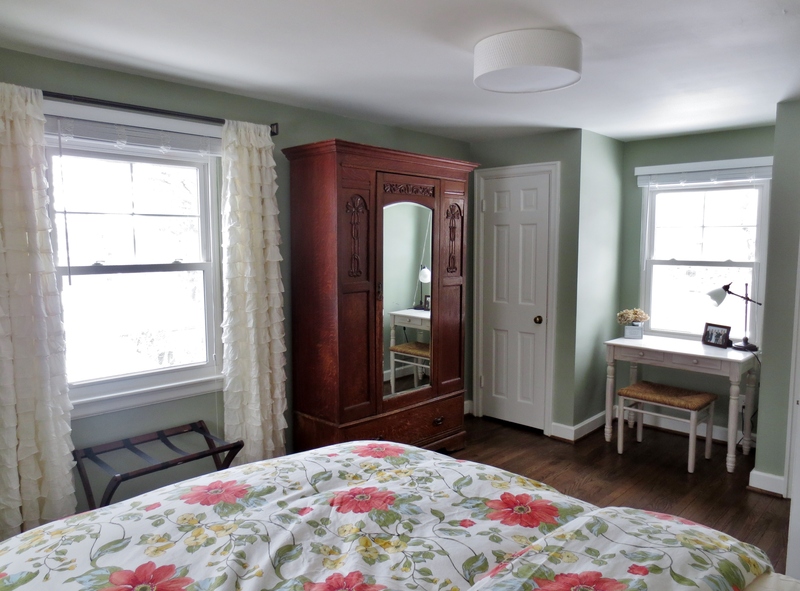 After the blinds were installed and the outlet panels replaced, we moved the furniture back and then added a rod and curtain to the one non-dormer window in the room. The rod is from Target and the curtains are from Urban Outfitters. I found them a long time ago, waited until they went on sale (because they are a little pricey, no?) and then scooped them up. They’ve been hanging out in the guest room closet since summer. This room gets the slow mover award for sure. 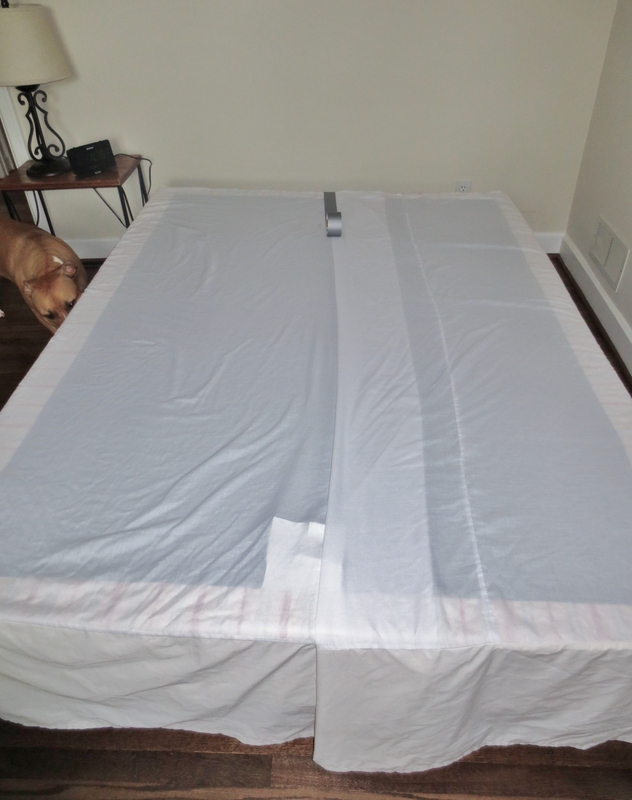 I swear that I bought the 96″ length curtains and even had Mark hang the curtain rod at the top of the ceiling before I actually got the curtains out of the closet and realized that regardless of what I may have ordered, what I had was only 84″. So I had to bat my eyes and politely ask Mark to lower the rod. He mocked me (which I deserved) and then graciously did as I asked. Good man. So here’s where we are now. I love the soft green color on the walls and the classic and feminine look of the floral duvet coupled with the ruffled curtains and the antique furniture pieces. The last thing we would like to do in here is add a headboard, maybe out of the left over barn board from the sun room so that’s on our agenda once the weather decides to come above freezing. It’s going to do that soon right? One last thing I will walk you through is the floor covering situation. After we got rid of the ugly, cheap brown rug, we were using an equally cheap but not as ugly sisal in there as yet another place holder until we got around to painting, etc. I fully expected to buy another rug once I finished painting and adding the new window treatments, but as I started to put all the furniture back I started to think that maybe the room didn’t “need” a rug. Don’t get me a wrong it could “use” a rug, but good rugs are expensive and I sorta got to thinking that a cheapish rug (which is all I have the budget for right now) wouldn’t really add anything, so I decided to forgo the rug for now and just added the little IKEA sheepskin at the side of the bed so that guests have something soft underfoot. What do you guys think of that choice? Do you think I should consider adding a rug down the road? So that’s the story of the guest room. I hope, if nothing else, it inspires a few more visits from friends and family. Lord knows this weather isn’t very inviting but hopefully our guest room is! 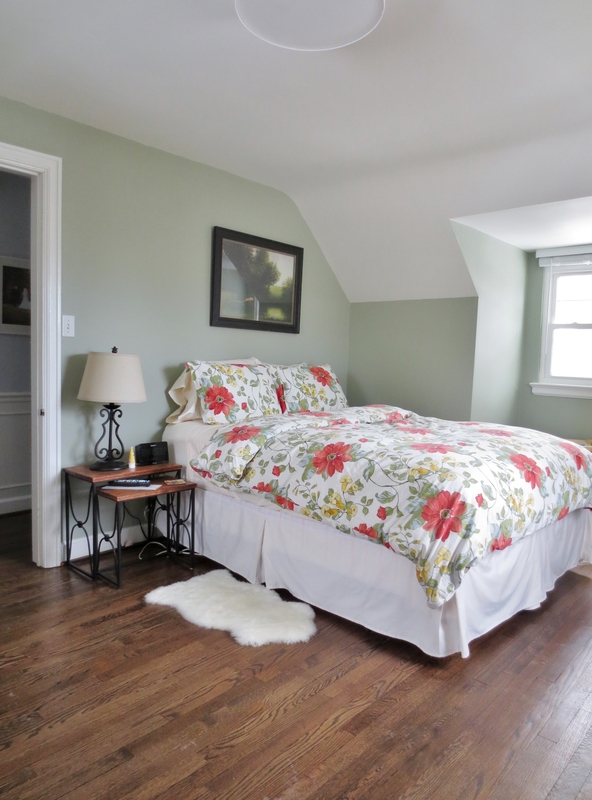 Love the paint color, Kate! Beautiful room…lucky guests! We’ve been through about eight colors trying to find the right color for an accent wall in the nursery(!) and while we settled on a color, we weren’t 100% Enter this post and the idea for half tint. The new shade retains the brightness of the original green, but looks better with more white. Thanks! And I like the sheepskin. 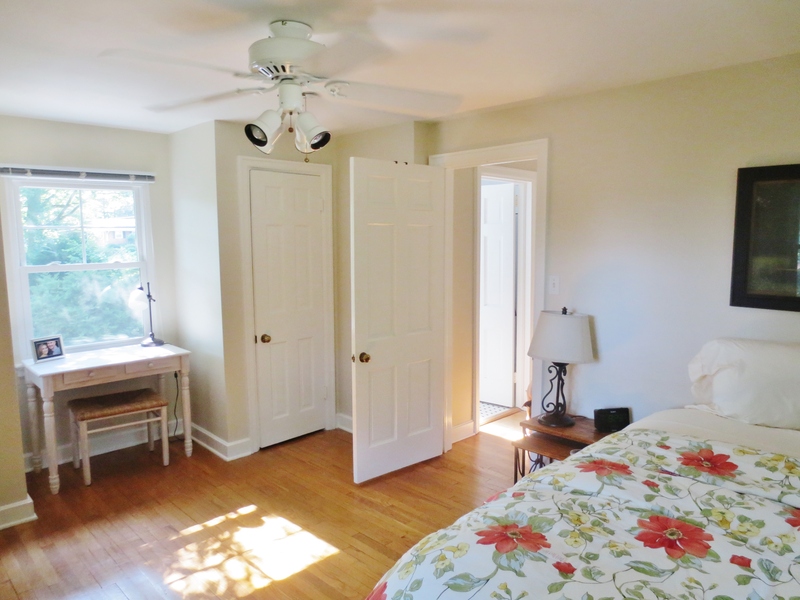 Master Bedroom – It’s Finally Done!